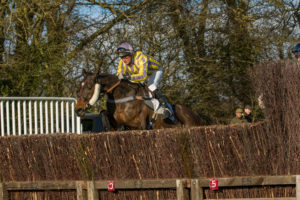 Henrietta Cranfield overcame a scary moment at the fourth last fence to register her first ever riding victory aboard bargain purchase Back Bar at the High Easter Racing Club Point-To-Point at High Easter, near Chelmsford, on Sunday. 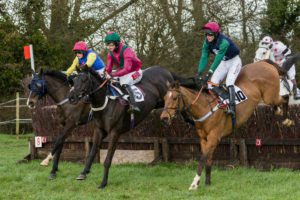 Cranfield, a 28-year-old lawyer currently working for Linklaters in London but originally from Layham near Hadleigh, admitted that the ‘ground was coming up to meet me very fast’ after a late jumping error almost ejected her from the saddle during the Novice Riders Race. But she managed to keep the partnership intact and Back Bar gamely kept going to hold off the challenge of Mahlers Spirit by six lengths. Trained by Alan Hill, Back Bar is owned by Henrietta’s father, Richard, and cost just £1,000 when bought out of the yard of Irish trainer Gordon Elliott last September. Alex Chadwick and Darren Thomas, both Newmarket-based jockeys, were two other riders to impress during a windswept afternoon when spectators were forced to dodge intermittent hail squalls. 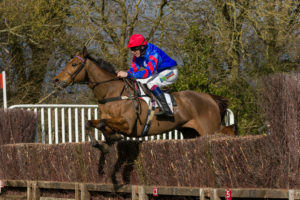 Chadwick, who only moved down to Suffolk at the turn of the year, gained a glowing commendation from owner-trainer Brian Dowling after Blackwood Rover snapped a four-year 23-race losing sequence when landing the two and a half mile Restricted Race. Chadwick followed Dowling’s instructions to the letter prior to seeing off Almost There and Shamat in a tight three-way finish. 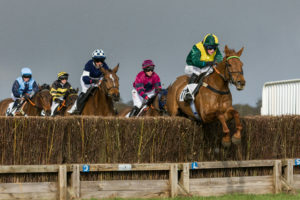 Thomas works for leading flat stable Godolphin and justified his decision to reapply for his riding licence and revert to amateur status by landing the Maiden Race aboard Racing Eagle. Trained at Chediston in Suffolk by John Ibbott, Racing Eagle comprehensively outstayed his six rivals to gain a first success after finishing second in four of his previous five starts. Judge Jonathan Benson was kept on his toes by the other three races, which all saw him preside over narrow verdicts. The tightest of the trio was the Ladies Open Race, which went the way of the favourite, Teeton Power, by just a head. Teeton Power was locked in combat with both In Fairness and Sand Blast approaching the final obstacle. And while lack of race sharpness took its toll on In Fairness (having his first start since 2017), Sand Blast proved a doughty opponent and even in the last few strides it still looked possible that he would complete a double for Dowling following Blackwood Rover’s earlier triumph. But Teeton Power scrambled home to land the spoils for Melton Mowbray trainer, Liz Harris. The Conditions Race for ten-year-olds and above was almost as close, as Burtredgipandgump overcame several awkward leaps in the closing stages to overhaul Kashmir Peak in the last five yards to score by a neck. Finally, the three and three-quarter mile Mens Open Race resulted in a half length success for Big Georgie after the favourite had dug deep to stave off the late thrust of After Aspen. 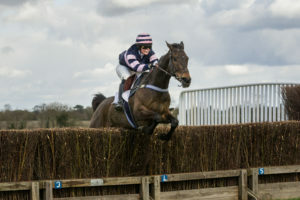 Big Georgie is trained in Worcestershire by his jockey, James Ridley, who enjoyed a fine afternoon as he also trained the winner of the Mens Open at Larkhill in Wiltshire. The PPORA CLUB MEMEBERS CONDITIONS RACE FOR NOVICE RIDERS.